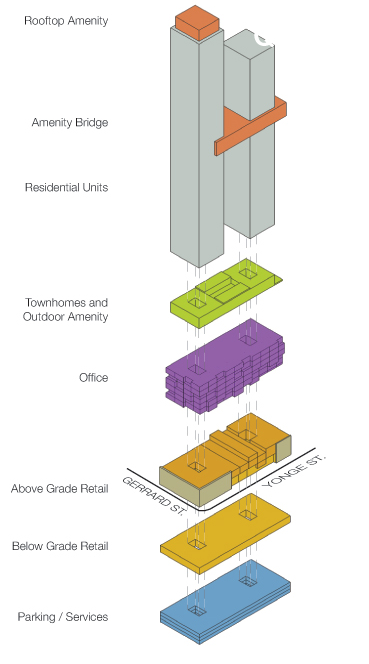 UrbanToronto has written extensively about the Yonge and Gerrard intersection, home to some of the city’s most interesting projects: Aura at College Park to the northwest and Ryerson’s Student Learning Centre to the south. Not to be overshadowed is the southeast corner of the intersection where KingSett Capital has proposed an ambitious project, designed by Quadrangle Architects, which will bring further urban density and a much needed streetscape upgrade to this rapidly developing neighbourhood. As mentioned in our previous article on the project, the plan is to incorporate the facades of two heritage buildings into the imposing 9-storey podium spanning half a block, which will house retail and office space. Rising up from this podium are two residential towers along Yonge Street, with heights of 73 and 62 storeys to the north and south respectively, connected together by a sky-bridge at the 51st and 52nd floors. The project is predominantly residential in nature, with 82,474 m2 of new space, yet the 9,389 m2 of retail and 17,370 m2 of office space both help to create an environment with a good distribution of functions - ingredients for a thriving urban community. The residential towers cater more to the working professional, with 648 (59%) one-bedroom and 107 (9%) studio units; the remaining space is allocated in a more family friendly manner with 241 (22%) 2-bedroom and 110 (10%) 3-bedroom units. The development also features 2,212 square metres of indoor and 909 square metres of outdoor amenity space, located in a variety of places across the building: above the retail podium, at the 10th floor surrounded by the terrace townhomes, the 9th floor terrace, the top of the north tower, and along the sky-bridge. While the common outdoor amenity space is less than that required by existing zoning requirements (0.82 m2/unit), the proposal proposes to make up for this by adding features such as sculptures and lounge areas on the terraces. Quadrangle Architects recently updated their project page to include new renderings of the towers, prominently displaying the sky-bridge as the centerpiece of the development. The bridge itself appears to be made up of a standard Pratt truss, visible in the image below as the white vertical and diagonal steel members, supported by the tower structure on either end. A notable feature of the bridge is the cantilevered portion that extends out beyond the southern tower - not only does this break the structural symmetry in a provocative way, but it also creates an interesting challenge for the design engineers. Tall structures must be carefully designed to consider the load from the wind; the taller the structure, the greater the effects. The sky-bridge is therefore a particularly interesting component of this project; the nature of this suspended and elevated structure meant that external analysis was needed from Gradient Wind Engineering Inc. to determine the specific influence of the wind on the public spaces. Based on these studies, the 51st floor outdoor terrace (region J - floor plan) on the bridge cantilever is to be shielded with a 4.9m wind screen, and the slender profile of the tower is meant to reduce the wind downwash onto this space. On the other hand, the courtyard (region K - floor plan) located on the middle portion of the bridge is adequately shielded by the tower masses and requires no extra protection. Much more will be coming regarding 385 Yonge in the coming months, but if you want to know more about it now, UrbanToronto's dataBase file and thread for the project are linked below. You can get in on the discussion in the associated thread, or leave a comment in the space provided on this page.